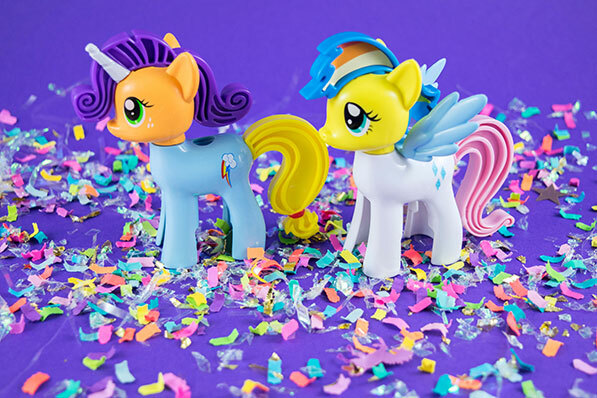 Build Your Own Mini Equestria with these My Little Pony Tinkertoy Sets | YAYOMG! The seventh season of My Little Pony: Friendship is Magic is coming to an end and My Little Pony: The Movie is about to hit theaters next week. With all this buzz, everypony is super excited about MLP right now, and who could blame them? 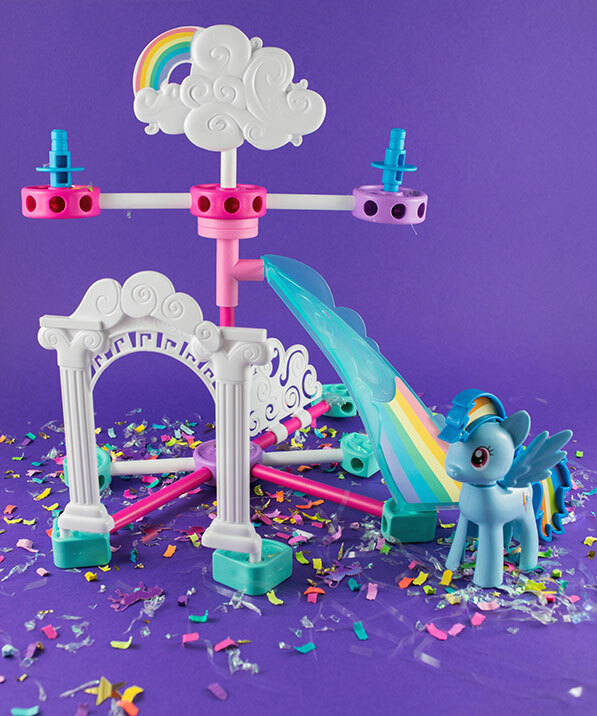 It’s a great time to show off your pony pride, which is why we’re super excited about the My Little Pony Tinkertoy building sets from K’NEX. These adorable sets let you bring the magic to life by letting you build, play, and create with your favorite Mane 6 characters. Thanks so much to K’NEX for sending these to us! 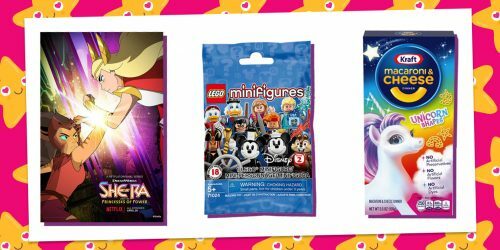 The My Little Pony Tinkertoy building sets are great for MLP fans of all ages. 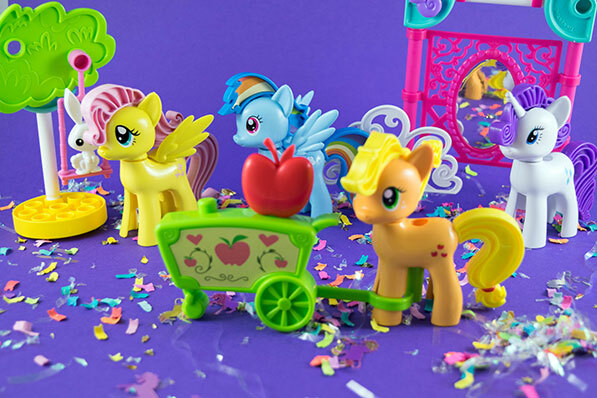 Whether you’re more into display and collect your favorite characters or are a budding engineer looking to build and create the magic of friendship at home and play alongside Rainbow Dash, Applejack, Fluttershy, and Rarity – nopony is left behind. 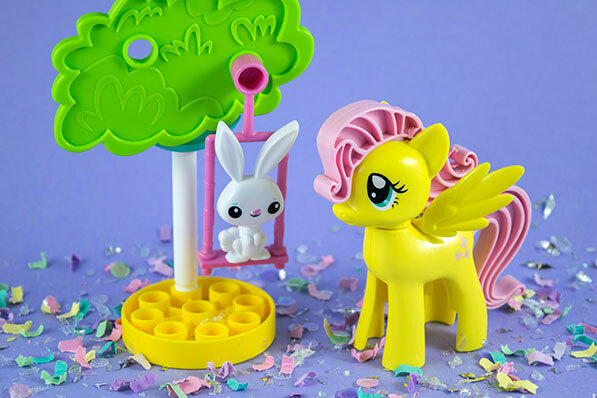 Fluttershy’s love of animals comes to life in a super cute tree swing set, complete with her bunny Angel. This set is on the smaller side at just 11 pieces, but it’s certainly not lacking in cuteness. Plus, the swing really works! When paired alongside the other sets, it’s one of the most adorable parts of Ponyville! Being the dazzling fashionista she is, it’s no surprise that Rarity’s set is so fabulous. 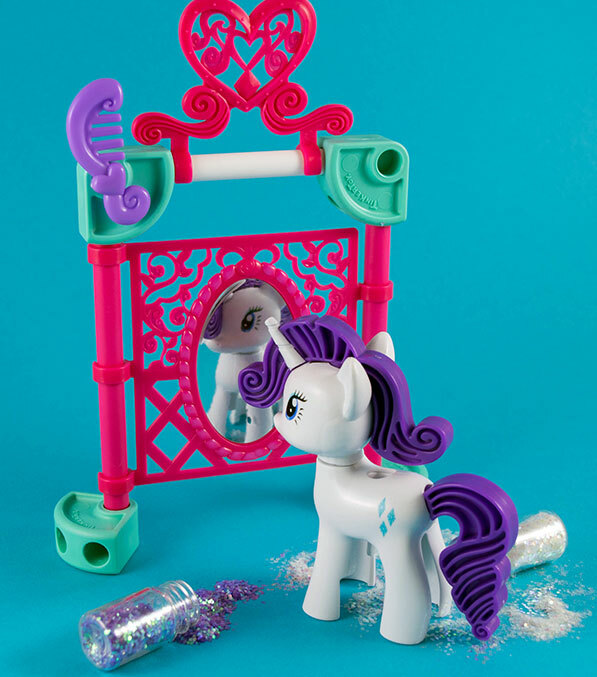 Assemble an intricate vanity from the Carousel Boutique and use the comb to brush Rarity’s mane so she’s picture perfect! Rarity’s hair was one of our favorites, there’s just something about the swirls and the dark purple that just look so great! 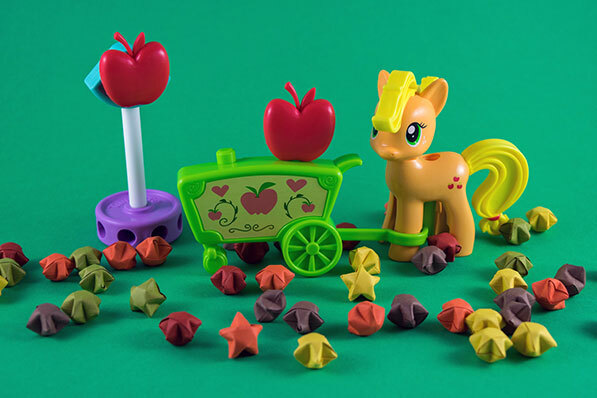 Don’t be a neighsayer, head down to the orchard and help Applejack harvest the apples for delicious apple fritters! Ya’ll are bound to have a ponyriffic time! You can help Rainbow Dash soar through the skies with an awesome Cloudsdale set, complete with working slide and spin ride that you can share with a pony friend. We’re all about the swirly clouds and pretty rainbows in this set! 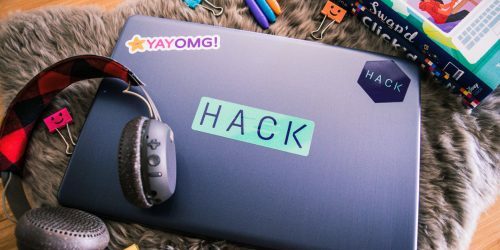 Since Rainbow Dash wouldn’t be the same without her colorful mane, this set includes stickers you can apply to the hair pieces so she can rock the rainbow in style. Rainbow’s set offers up a few additional ways to build, including this adorable seesaw! 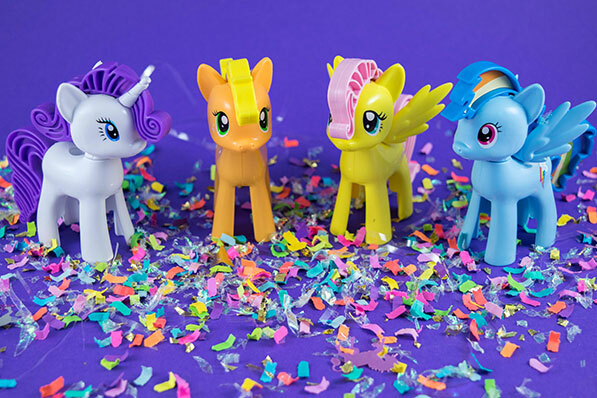 We’re loving all the brightly colored pieces and the super cute pony figures found in these sets. Each set ranges in price from $12.99-$49.99, depending on size. We’ll be keeping these pony cuties as desk companions after we disassemble our sets. Being able to build out some of the iconic Ponyville locations was really fun too. The sets snapped together pretty easily and the instructions were easy to follow. The trickiest part was placing the stickers just right inside Rainbow Dash’s hair pieces. 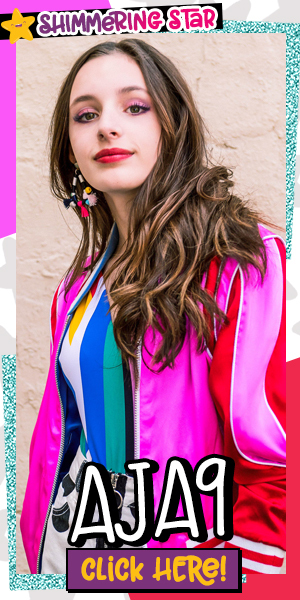 Can’t have our girl looking anything less than awesome! What we’re looking forward to most is seeing all the ways that MLP fans bring these sets to life in their own creative ways. We know all of you expert builders love to combine sets and toss the instructions aside. One of the best parts about K’NEX is the freedom to build anything your imagination can dream up. We made some Frankenponies, we know you guys will be MUCH more creative with your creations. 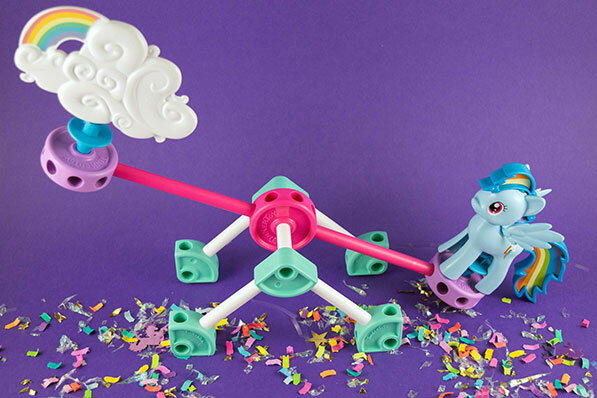 We love any toys that help tap into that love of building, engineering, and imagination, and these My Little Pony Tinkertoy sets definitely fit the bill. Can’t wait to see the other sets that will be released in the future! 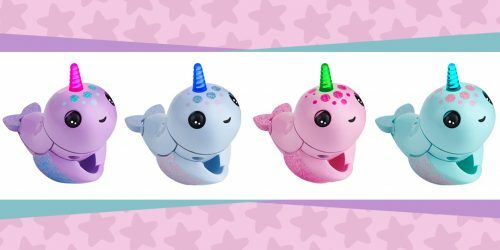 Looking for more ways to show off your My Little Pony pride? See if you can ace our Cutie Mark Quiz! Note: We received this product for free from K’NEX in exchange for a fair and honest review. We were under no obligation to write a positive review.